Pererindod Melangell Walk at Lake Vyrnwy / Llyn Efyrnwy Walking RouteA spectacular 15 mile linear walk passing by Lake Vyrnwy, and leading to Britain's oldest Romanesque shrine at the ancient church of Pennant Melangell. It is a challenging walk that traces a route between the Vyrnwy and Tanat Valleys, trodden for centuries by pilgrims, quarrymen and drovers. 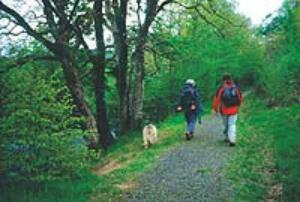 The name of the walk 'Pererindod MelangeIl' roughly translates from the Welsh for 'Melangell's Pilgrimage'. The legend of Melangell derives from two seventeenth century transcripts of a lost medieval Life of the Saints. One day a prince named Brochwel was hunting at a place called Pennant. His hounds raised a hare that took refuge in a thicket. On pursuit, the prince found a virgin praying, with the hare hiding under the folds of her garment. The hounds were urged on but fled, howling; their huntsman raised his horn to his lips and was unable to remove it. The virgin informed the prince that she dwelt at this place, and that she had fled here for refuge. So impressed was the prince by Melangell's godliness that he granted the valley to her and here she founded a religious community. St Melangell’s Church is located near Llangynog in the Tanat valley. 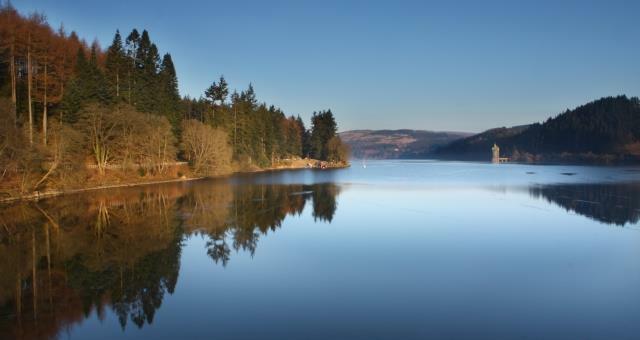 A spectacular 15 mile linear walk passing by Lake Vyrnwy, and leading to Britain's oldest Romanesque shrine at the ancient church of Pennant Melangell. It is a challenging walk that traces a route between the Vyrnwy and Tanat Valleys, trodden for centuries by pilgrims, quarrymen and drovers.